Bea Tang recently achieve the momentous milestone of completing her 1,000th bootcamp session with UFIT! 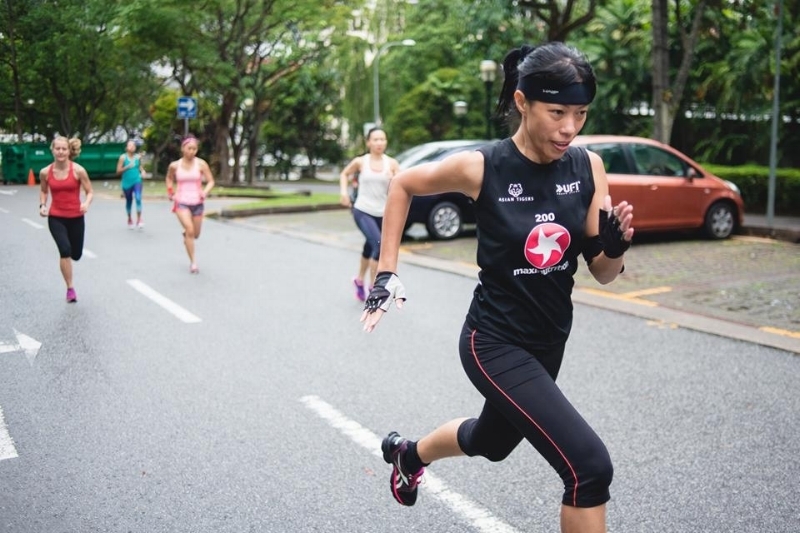 Bea is a familiar face in the UFIT Bootcamps community for the last 5 years, training daily in the lush nature of the Botanic Gardens, or crushing a Metcon session in the “jungle” of CrossFit Bukit Timah. Bea was a corporate lawyer who used to spend long hours at work. A new year resolution at the end of 2012 to get healthier started Bea on her fitness journey, and she hasn’t looked back since. Through bootcamp training and attending UFIT’s Clean & Lean Challenges, Bea credited UFIT with giving her a new and balanced perspective on fitness and health. Being fit and healthy is a way of living, not about obsessing over the numbers on the scales. We caught up with Bea to find out what she loves about outdoor bootcamp trainings, what keeps her motivated, and her hangover cure! Hello Bea! Congratulations, and thank you for speaking with us! First tell us a little about yourself - how old are you? And which line of employment are you in? Hello! I’m well into my 40’s and older than I would like to be! I’d like to say I am an enlightened lawyer – which in other words means, after over 20 years of slaving away, I’m no longer in the profession that most wish could be chained to the bottom of the ocean. These days I’m generally a contented doggy mommy. My husband and I have 2 rescued Schnauzers who keep my life fairly occupied. On weekdays, I usually wake by 6am. I’d feed the dogs, head out for a work out, walk the dogs, then head home to prepare dinner. Some days I might meet up with friends for lunch. Others, I might take one of our Schnauzers, Kirby, to volunteer as a therapy dog. Mostly, I keep up with my readings, keep an eye on our investment portfolios, and run errands etc. The day tend to end early after dinner with my hubby, and a longer walk with the dogs, unless we’ve social events. Do you make time for fitness training everyday? My favourite time for a workout is early in the morning before the sun gets too high and the day gets too warm. I love the hour where the sun is just over the horizon, and I can get my workout in before the hustle and bustle of the day begins. Sunshine, endorphins, and good friends - the perfect way to start a morning! Do you workout with your partner? My husband, Christopher and I, have made it part of our weekend routine to start the day with a bootcamp session at Fort Canning and the Botanic Gardens. Tell us more about how you got to know about UFIT Bootcamps over 5 years ago, and what got you interested? At the end of 2012 when I decided to stop work as a full time corporate lawyer, I, as many others, made a New Year resolution to get my fitness journey back on track. I signed up for a pack of 5 bootcamps with UFIT and embarked on my first bootcamp session at MacRitchie Reservoir Park. That left me panting and rather demoralised but I persisted nevertheless. By the end of the 5 sessions, the bootcamp instructor had inspired me to register for an unlimited bootcamp package. I haven’t looked back since! By the middle of 2013, 6 months after training with UFIT, Bea has clocked in 100 bootcamp trainings! Were you already physically active before that? In school, I was very physically active, training and participating in mid-distance and cross country races. I also used to be a wakeboard junkie, heading to a secluded river in Johor to ride for entire weekends and occasionally took part in the novice category of local competitions. My husband and I are also avid scuba divers – although some will argue if that constitutes as physical activity. However, work took a precedence over health and my fitness level deteriorated dramatically. Age and a slowdown in metabolic rates also meant that I started piling on the pounds, although thankfully, my natural body shape and tan continued to project an illusion of health to the untrained eye. Have you done other bootcamp trainings before starting bootcamp training with UFIT? No, although prior to UFIT, I did do personal training sessions for several years and occasionally joined my hubby at his gym. Whilst it was comfortable in an air conditioned environment which provided drinks, towels, and even workout attire, nothing beats being outdoors with the tropical flora and fauna (and the bugs and wildlife that go with them)! 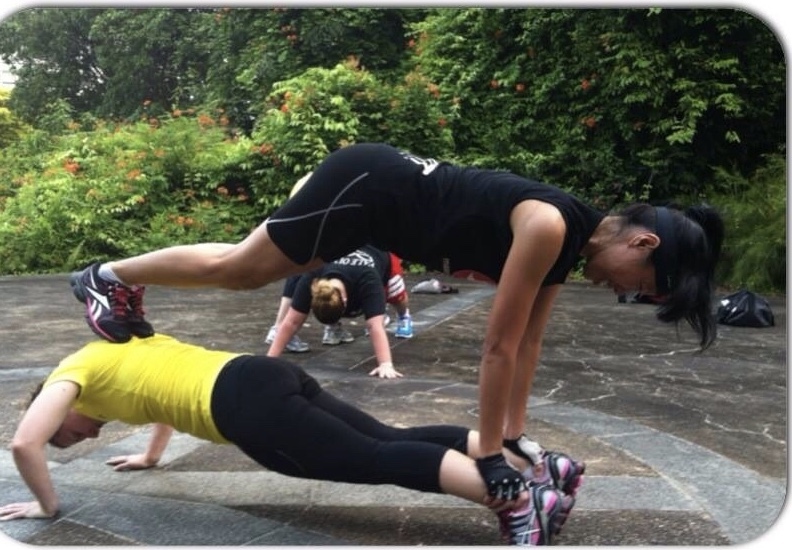 Attempting a plank tower at Fort Canning bootcamp training. Which UFIT bootcamp trainings do you attend? Has that changed over the years? I started off training Tuesday and Thursday classes at MacRitchie which with its peaceful and tranquil environment, remained my all-time favourite location – scary monkeys notwithstanding. Subsequently I joined the SHEFIT (women only) sessions at the Botanic Gardens. Last year, I decided to give MetCon at CrossFit Bukit Timah a shot. I realised then that the booster of weight and intensity was what my body needed. I’ve since been doing 3 to 4 MetCon trainings on weekdays, and bootcamps on weekends – except when we’re travelling. What motivates you to continue bootcamp training all these years? I’m a masochist and relish the pain! Vanity is also one of my middle names - I’m full of glee when friends and family express envy at my defined shoulders and physique. It gives me an incentive to maintain them. What is your favourite part of UFIT Bootcamps? The camaraderie of working out in a group, and the competitive yet encouraging pressure which motivates me to keep going. Whilst personal training gives me dedicated attention, I found it somewhat lonely. And without others to benchmark myself against, it was easier for me to slack off and get lazy. I must say I was also very effective in convincing my former trainer that I could not do another push up. Do you have a favourite trainer, and what you like the most about him/her? I have no favourite trainer in UFIT as I love them all!! Currently, I think CY and Jed at MetCon class in CrossFit Bukit Timah are great, as they really kick my a** and push me to find that extra ounce of energy I didn’t think I have. I love Marcus at Sundays’ Botanic Gardens sessions as he is such a teddy bear - intimidatingly covered with ripping muscles, and yet the gentlest and most encouraging trainer. I love Rachel at Saturdays’ Fort Canning sessions even though I sometimes thought I could murder her during yet another unending stairs run or sprints up the grey hill! Weighted plank at MetCon training, with the perfect partner! Fitness Philosophy - What does being fit mean to you? What are your fitness goals? My goal is to be able to age gracefully and actively in a couple of decades from now. Neurological diseases like dementia and Parkinson’s run in my family. The doctor advised that I have a strong pre-disposition to such diseases, and one of the best forms of prevention is maintaining an active lifestyle. How has your outlook on fitness changed in the last 5 years with UFIT? I learned that I can’t adopt a myopic approach to fitness. It’s no longer a goal of losing a few pounds, a few inches, or being able to finally do that pull up. Fitness, to me, is now a lifelong journey. I’m very glad I restarted that journey with UFIT and continue to keep that New Year resolution I embarked on more than 5 years ago. Working out is just one aspect of it. Watching what I eat and drink is an even more significant part. UFIT gave me a significant jolt and insight into that when I signed up for my first Clean & Lean Challenge in 2014, and then again in 2016. In both challenges, I’m proud to report that I came in runner-up, and more importantly, learned what it takes to inculcate a healthy eating habit. However I’ll be the first to admit that I’m an incorrigible foodie and have a particular weakness for beers and wines. How do you motivate yourself in the times when you didn’t feel like exercising? Thankfully, I don’t need too much motivation as working out in the mornings has become entirely engrained in my lifestyle. If I miss a workout, it feels as if the day didn’t start quite right. The only times I need a bit more of a push is after a late night out. My hubby will give me a little kick to say that bootcamp is the best cure for a hangover - which is the whole truth…followed by a Bloody Mary. Have you inspired friends and family to start being more physically active? I like to believe I did. My husband is now a converted bootcamp fan. Our active lifestyle also rubbed off on my dad - he’s 82 this year and is able to walk/jog for around 10km daily. For his 80th birthday, we took him on his maiden rock-climbing experience, and he rang the bell at the top of the wall before a teenage kid next to him did! What would you say to those who say they are too old/ too busy/ too injured to start exercising? Life is too short for excuses. To my trainers – please don’t use this against me the next time I whine! Newer PostUFIT Perks just for you! Older PostGet to know the new CEO of UFIT - Will Skinner!